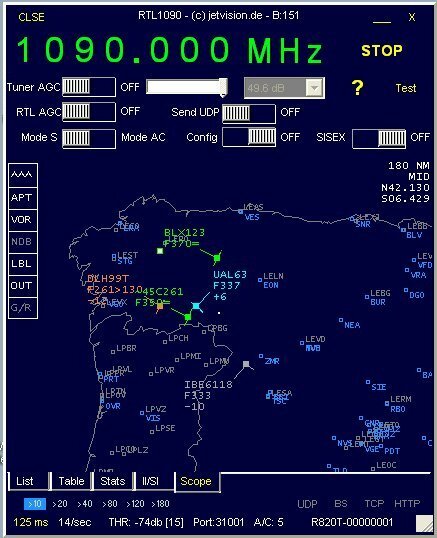 The beta version of the popular ADS-B decoding software RTL1090 has been updated to version 3. Version 3 comes with a simple radar visualization scope built into the software, which allows you to see aircraft directly in the RTL1090 software. 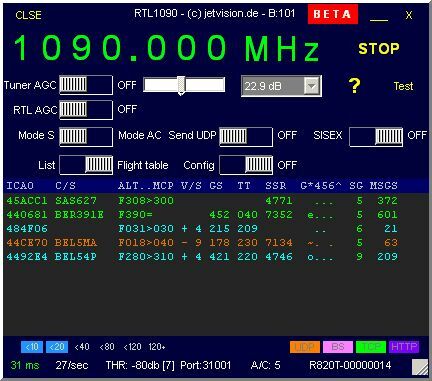 The popular RTL-SDR ADS-B decoder RTL1090 requires the rtlsdr.dll and libusb.dll files to be manually downloaded and then placed into the RTL1090 folder. However, now the author of RTL1090 has created an automatic installer which will download and install all the required files automatically. This internet based utility helps you with setting up a complete RTL1090 installation with almost no manual intervention. It automatically downloads the relevant files as rtlsdr.dll, zadig.exe and helps to configure zadig with a built in tutorial. The installer is called the IMU (Installer and Maintenance Utility) and can be download from the RTL1090 website at rtl1090.web99.de. – Decoder improved by brute force 1-bit error correction and brute force DF11 and DF17 override for unknown DFs. This may be tough stuff for slow computers. If your computer slows down considerably return to a previous version please. – Tabs introduced – List/Table selection moved to Tabs. – Stats tab added: this brings back the previous status bar info about USB packets per second. – II/SI tab added. This tab adds the ability to quickly scan the Mode-S interrogator codes around. A “radar1090.txt” file can be added to the rtl1090 folder that holds II/SI code decodings. A sample file is attached. The II/SI collection can be reset by a right mouse click action. The recently seen codes and the last aircraft responding with that code are display in red onwhite. – Context menu (right mouse click) for text window, “listhold” established by menu selection, revoked by mouse click. Rob from SonicGoose.com has put together a tutorial on how to use Globe-S RTL Edition with RTL1090. Globe-S is a light radar viewer (similar to Virtual Radar Server, ADSBScope etc) meant to interface with the popular ADS-B decoding software RTL1090. See the Yahoo Groups release post here for the full build change notes, and download the beta from their website here. The RTL-SDR can be used as a super cheap real time air radar. Modern planes use something called an ADS-B (Automatic Dependent Surveillance-Broadcast) Mode-S transponder, which periodically broadcasts location and altitude information to air traffic controllers. The RTL-SDR can be used to listen to these ADS-B signals, which can then be used to create your very own home aircraft radar system. Compared to dedicated commercial ADS-B receivers which can go for between $200 - $1000, the $20 RTL-SDR is very attractive for the hobbyist in terms of price. However, note that the RTL-SDR probably shouldn't be used for ADS-B navigation in a real aircraft for safety reasons. 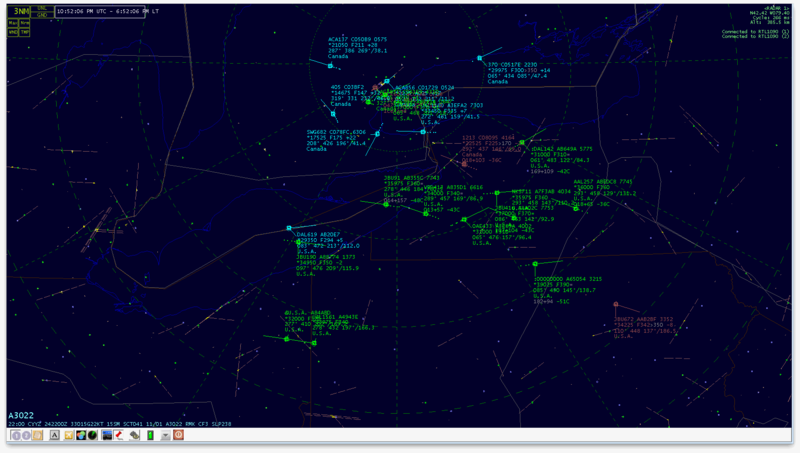 ADS-B broadcasts at a frequency of 1090 MHz. It has been discovered by the RTL-SDR community, that the RTL-SDR with R820T tuner has the best sensitivity at this frequency. The E4000 and other tuners perform poorly in comparison. So it is recommended that you obtain an R820T tuner if you want to set up ADS-B decoding with the RTL-SDR. Recently there has also been talk about the R820T2 tuner, which seems to have slightly better performance too. See the Buy RTL-SDR dongles page for more information on where to purchase. We also now note that recently new higher end SDR's like the $199 Airspy have developed very good ADS-B receivers that are several times more sensitive that the RTL-SDR. In this video, YouTube user Superphish shows a timelapse of air traffic over New Zealand using RTL-SDR, ADSB# and Virtual Radar Server.